Toradex engineers will be presenting their latest computer on module – the Colibri T30 incorporating the NVIDIA® Tegra™ 3 – at the upcoming RTECC shows in Vancouver (Canada) and Seattle (USA). If you visit their stand at either of these shows you will also have a chance to win one of eight Performance Kits up for grabs. 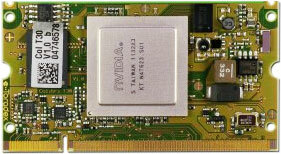 The kits include a Pico-ITX carrier board and are powered by the dual core Colibri T20 computer on module, based on the NVIDIA® Tegra™ 2 processor. - Open GL 2.0 ES User Interface Frameworks including the UI Composer from NVIDIA®, the EB Guide and Silverlight. - The Oak USB Sensor and Interface Family.